Wow! It seems like forever since I've blogged, but I'm finally back from my vacation. Had tons of fun even though it was super hot and humid! Got a lot of catching up to do, can't wait to read all the updates. I'm so pooped so I'll just leave you with a glimpse of what I got from HK and Japan combined. This is maybe 70% of my haul excluding clothes. I didn't buy a lot this time since I did most of my hauling back in February. I was just at the maximum for my free luggage allowance...25.1kg haha. Most of my purchases were influenced either by other bloggers or sites like Imomoko, Mihoko and Ichibankao..things that are hard to get. I was kinda disappointed that Sasa didn't carry the Beauty Maker brand in their stores. Kao Liese Bubble Hair Color in Casis Berry and Glossy Brown (I couldn't make up my mind). I got mine in HK, in Japan, they were called Prettia, not too sure of the name difference. D-Up Gel Look Top Coat. As seen on Ichibankao. Angel Cotton. I think it's the same as the one from Fuz's blog. I couldn't find it on Mihoko to check. It's got the same Chinese name but the packaging is different. I got these at the 100yen store. Oh! You know those UFO catchers that drive you crazy when you're trying to get that darn prize? Well I actually won something on my last night in Tokyo! I played 2 different UFO catchers and this Rilakkuma machine had giant Rilakkuma heads. I got my Rilakkuma on 5/6 tries! Funny thing was, I pressed the catch button too quickly and one of the prongs went into the area where the toy drops into while the other 2 prongs went on top of the plushie. As the prongs went back up, the other 2 prongs that were touching Rilakkuma hooked onto its ears as it went back up! The plushie is of good quality too! 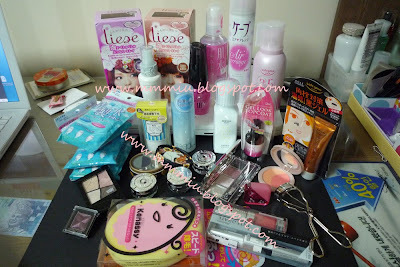 Wow..u got so many nice stuff from HK and Japan..
ah love the last pic! Welcome back, Mui Mui! Nice hauls from Hong Kong and Japan. 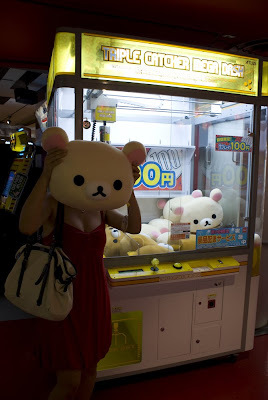 I love the Rilakkuma machine! Nice haul and super cute prize! ahhh.. i love rilakkuma! ur so lucky u got it! glad u had a good trip sweets! Huge haul! Envy envy. Hope you can do reviews about them all soon. LOL at the bear head! and congrats on your rilakuma win! winning anything from those things are so difficult! Glad you had a great time. Please come to Kyoto/Osaka/Kobe next time!!! yayyyy for winning something!!! it's humongous! !